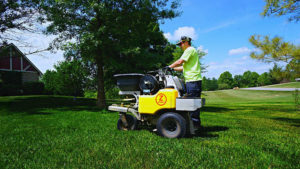 No need to feel lost or overwhelmed about the lawn work to be done this fall! Our team has collaborated on this subject just for you and came up with a list to follow. Just use it as your guide! Clean Up Debris – grass clippings and leaves can be mulched ( and they are great for your flower beds, shrub beds or vegetable garden!). Remember to clean out landscaping beds. Clean Up Debris – grass clippings and leaves can be mulched. Mulch grass clippings into your flower, vegetable garden and shrub beds. Remember to clean out landscaping beds. Clean out leaves and other debris from beneath deck, shrubs, stairs, around A/C unit or under porch. These things can trap moisture and cause rot . Dig up any tree saplings you discover growing along your home’s foundation. If you don’t do it now when they’re small then by next fall, they’ll be much bigger with deeper roots that might begin to slowly damage your home’s foundation. Clean your rain gutters and downspouts and make sure these drain away from your home. It’s time to get started. Pick a weekend or two for getting the yard work done, and you’ll be surprised how fast it will go by just having a plan to follow. In no time at all, your yard will be ready for fall weather.